Smores-style ice cream: The only way to make this campfire favorite ever more enticing? Ice cream-ifying it! Create a deconstructed smores-style ice cream treat by spooning marshmallow topping onto a few scoops of chocolate ice cream. Sprinkle with crushed graham crackers and voila! Smores ice cream! Salted caramel pretzel ice cream: All you need for this enticing treat is vanilla ice cream, caramel sauce, and salted pretzels. The sweetness of the caramel pairs fantastically well with the salted pretzels, create that salty-sweet taste that we know you love. Monster Ice Cream: Here’s a take on the classic monster cookie. Vanilla ice cream is the perfect base for the sweet toppings in this recipe. Simply sprinkle a scoop of vanilla with chopped nuts, mini M&Ms, and chopped Reese’s peanut butter cups for a full-of-flavor chilly treat! Whoppers Ice Cream: Love the taste and texture of these sweet little malted milk balls? All you need is malted milk powder! Sprinkle a spoonful or two atop a scoop of your favorite flavor. To mimic Whoppers, we suggest using chocolate ice cream! 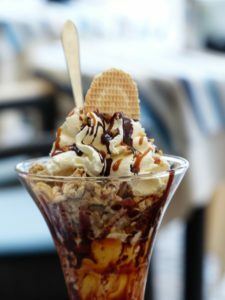 “Snickers” Ice Cream: Sure, you can add chopped snickers to the top of your ice cream, but why not infuse the flavors of a snickers bar throughout the entire scoop? Spoon caramel sauce and hot fudge on top of a scoop of ice cream (we suggest vanilla or peanut butter), and simply sprinkle on some chopped peanuts and you’ve got a cone-full of snickers! The Almond Joy: Coconut pairs perfectly with summer, don’t you think? Sprinkle shredded coconut and chopped almonds overtop a scoop of chocolate for a fun frozen twist on the Almond Joy! Celebrate the start of summer with one of these delicious candy-inspired ice cream treats. Let us know which one is your favorite! Summertime is upon us and it’s time to party! From pool parties to barbecues, consider incorporating these fun and easy candy ideas into your next outdoor event. They’re all perfect for summer and able to withstand the hot, hot heat! · Candy! Think non-melting candy, such as jelly beans, gummy fish, rock candy, lollipops, and skittles. Lay a beach towel along a table. Arrange beach buckets in a fun way, filling them with candy. Allow guests to fill their candy bags with summery shovels! Make Jello as package instructs, within the clear plastic cups. Once Jello is in a solid state, top with a layer of vanilla pudding. Sprinkle pudding with crushed graham crackers. 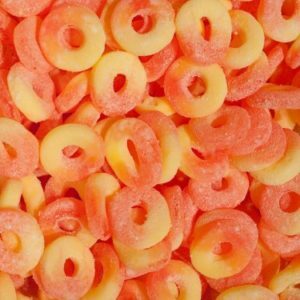 Place two-three gummy bears in the “sand,” along with a gummy lifesaver or two. Garnish with a fun paper umbrella! Skewer gummy candy onto skewers, creating a fun pattern. Serve on a fun plate, just as you would regular kabobs! With these fun summer candy recipes, you’ll be ensured plenty of fun (and tasty!) days ahead.